Concept & Form Design | Agencia de Diseño, Valencia. Categories have its own design languages in which colour is one of the main cues helping consumer's decisions driving factors such as Emotions, Impact or Varieties. Design will help clarifying the strategic decisions as whether to follow the rules or challenge them. Sometimes good ideas are not enough understood because are neither clear nor motivating, especially when only executed in two-dimensional lay-outs or in rough form. Good prototypes will give a better understanding and more precise feedback of what can be improved for the next stage. We always work in direct contact with our clients in order to define the context in which our action will take place jointly, with carefully defined positioning and well-listed objectives. We only start once we have learned the role that design will play in the overall communication objectives of the project. Good Key-visuals will express the quality of your products more effectively and clearly. To describe the product, adding the emotion that moves the target audience to stay interested in what you are offering. Currently, it is a basic tool for expressing the brand’s values and essentials of the product from shelf to home. Management of brand equity is an essential asset to a company. Good design will help your brand to reach the mind of the consumer with a clear identity related to your products. We can help you to create the strong and differentiated brands that your specific products need in order to be well known and appreciated. Packaging offers unique advantages in brand communication: it can be very active at the point of sale and it will continue to advertise at home. As conventional communication is becoming more expensive and more difficult to control, the extra value generated by excellent design is virtually free, in terms of variable cost. Web design aimed at crafting sites to provide an optimal viewing and interaction experience across a wide range of devices: easy reading and navigation with a minimum of resizing, panning, and scrolling. We intend it as the force that drives and enables you to achieve innovative and effective goals in the direction of your brand objectives. The agency develops and selects ideas that will transform the briefing concepts and requirements into texts, images and graphics that will communicate your products and brand values effectively. Good packaging design can make products work harder, adding more value and competitive advantages. Creative and innovative packaging communciation to demonstrate distinctiveness and added value that the consumer will appreciate and that establishes a good relationship with the brand it represents. Based on the creative proposals selected, to achieve a good design in every detail, the agency spends some time with the client and carries out carefully defined and agreed fine tuning that will define the role that the intended design will play. A real work in progress until finding its final look. With extensive experience in printing and reproduction techniques, our Final Artwork will ensure the quality of the implementation of the project when the industrial processes involved are applied. 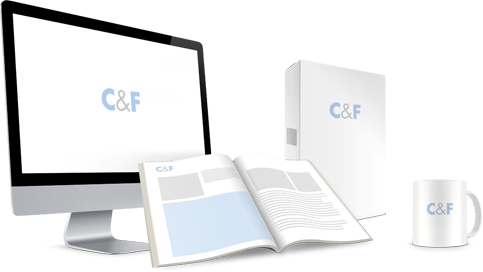 The wide experience and knowledge of C&F’s technological resources are supported by the over 25 year relationship with major graphic and packaging providers. Logo-brands need to be clearly visible and distinctive and in a unique typestyle that can be registered. Our main objective is to enhance distinctiveness and own personality letters formed in combination with highly visible brand symbols when required. feel free to contact us. We will be glad to answer all your questions.